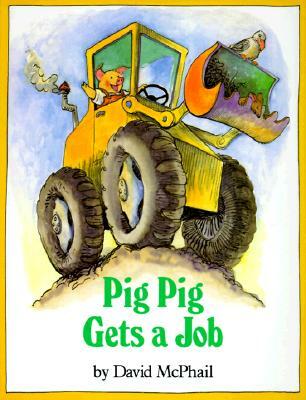 I was fascinated by this book – Pig Pig Gets a Job. I mean, it’s always tough to find a good job – especially in this economy – but in this case, the job-seeker is a small, talking pig! He wears red overalls, and he’s very enthusiastic, but he also seems young and inexperienced. I’m getting paid to write this review – but who’s ever going to pay poor little Pig Pig? This book reminds me of the episode of “Seinfeld” where George tries to find his way to a new job by being hopelessly unrealistic, saying “I like sports… I could be a sports announcer….” But as I understand it, there’s a whole series of books about this daydreaming pig. David McPhail also wrote Edward and the Pirates, which my friend Richard swears is one of his favorite children’s books. But Pig Pig adds a charming simplicity to McPhail’s stories – which is at least a starting point for funny adventures.